The death of Lee Kuan Yew leaves his seat in Tanjong Pagar GRC vacant. Recently a Bloomberg journalist asked me to comment on the suggestion that Lee’s seat in Tanjong Pagar be left vacant as a mark of respect. Her resultant article can be read here. Some commentators have suggested that the Opposition should boycott any by-election, giving the PAP a walkover similar to the ones it has enjoyed ever since Lee Kuan Yew’s constituency was included as part of Tanjong Pagar GRC. In addition a lot of people have been asking me whether I think a by-election will or even must be called. The fact that any one could even suggest that denying the democratic rights of the citizens of one ward to choose their representative is a way to show respect for the founder of our one-party authoritarian system goes a long way to explaining how far from being a democracy that system is and how far we have to go to become a developed nation in terms of our political and legal structures. LKY’s seat had of course been effectively vacant for some time. For many years other MPs in the GRC had performed his constituency duties. Ill-health and advanced years also meant that his appearances in Parliament after his unopposed re-election in 2011 were mostly perfunctory. In a democracy an MP who was incapacitated by advanced years or ill-health would have resigned to allow a new and fitter incumbent to perform the duties that he was no longer able to. In addition because of LKY’s deliberate creation and reinforcement of a climate of fear, and the very real measures he took to crush anyone who stood up to him, the voters of his GRC have been denied the right to choose their representatives for several decades. Even in 2011, when every other seat was contested and our aim was to see Singapore’s first non-walkover GE , a team of independents ran out of time in filing their nomination papers and were disqualified. The fact that the people of that ward have gone without choosing their representatives for so long means that there is a more urgent need to hold a by-election in his constituency now. But can the PM leave the seat vacant indefinitely in defiance of every democratic norm but as has been normal PAP practice until recently? The short answer and the absolute legal fact is that it would be unconstitutional not to hold a by-election unless the Prime Minister decides to call a general election within the next three months or so. The argument ( thanks to Article 14) runs like this. —(1) Whenever the seat of a Member, not being a non-constituency Member, has become vacant for any reason other than a dissolution of Parliament, the vacancy shall be filled by election in the manner provided by or under any law relating to Parliamentary elections for the time being in force. It was established by the Court of Appeal decision in Vellama d/o Marie Muthu v AG (2013) that the calling of a by-election is mandatory and not discretionary and that it has to be held within a reasonable space of time, normally three months. (2A) In respect of any group representation constituency, no writ [for a by-election] shall be issued under subsection (1) for an election to fill any vacancy unless all the Members for that constituency have vacated their seats in Parliament. This Constitution is the supreme law of the Republic of Singapore and any law enacted by the Legislature after the commencement of this Constitution which is inconsistent with this Constitution shall, to the extent of the inconsistency, be void. Article 24-(2A) of the PEA is clearly inconsistent with Article 49 of the Constitution. Therefore under Article 4 of the Constitution it is void. 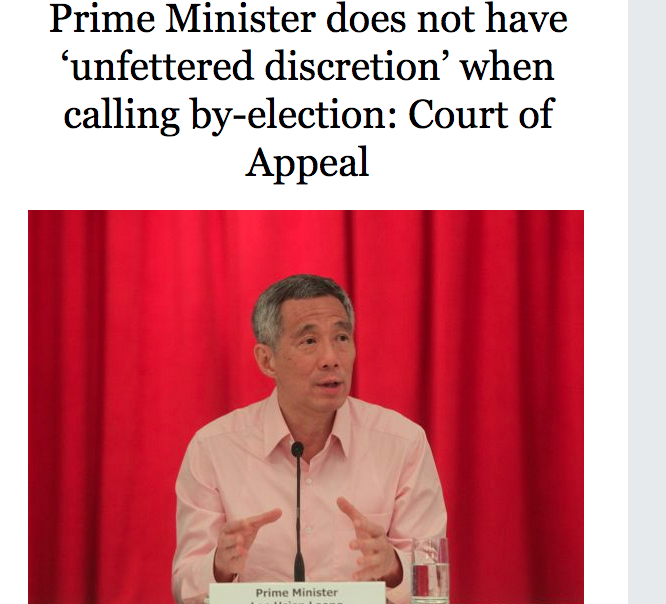 Therefore the Prime Minister must call a by-election for Tanjong Pagar GRC, or at least for the constituency vacated by his father’s death, within the next three months. If the PM refuses to do so, I (and I know my Party members would join me) would support an application to the Court to declare that the PEA is inconsistent with the Constitution and that a by-election must be called. It should be easy for Lee Hsien Loong’s poodle, the Elections Department, to carve out Tanjong Pagar SMC from the GRC if the PM does not want to call a by-election for the whole GRC. However as it was uncontested in 2011 it would be right now to hold an election for the whole GRC. In the event that the PM observes the Constitution and calls a by-election, it would be good for the Opposition parties to come together and agree to field a joint “A” team against the PAP under an umbrella with all our strongest candidates combined. This would be an important step in the process of transforming the Opposition in the eyes of the electorate into a credible force that is ready to form an alternative Government. LKY was an absentee landlord in Tanjong Pagar GRC anyway. Indranee did all the hard work in the constituency while the Floundering Father sits around giving talks, planting trees, releasing books or dispensing unsolicited advice to other countries. 1923-2015. Good riddance to bad rubbish. A joint GRC team is a good idea. It had been on my mind as well. But I remember reading somewhere that all members of a GRC team must be from the same party, which seems diabolical since individuals who are not affiliated to any party may stand in together in a GRC! I hope I am mistaken. “But can the PM leave the seat vacant indefinitely in defiance of every democratic norm but as has been normal PAP practice until recently?